Gawler Community Retirement Homes (GCRH) has six villages in Gawler and this includes James Martin Village at Willaston. The popular retirement village was purchased by the community based organisation in 2011. As part of the plan for James Martin Village, it is hoped to provide additional affordable independent accommodation for retirement aged people over the next few years. The form of accommodation being offered is proving popular, as it provides good quality accommodation at reasonable prices, along with ongoing maintenance for the homes. As part of the plans for the James Martin, GCRH has been fortunate to receive support from another community organisation. The Rotary Club of Gawler Light last weekend provided assistance with an upgrade to the entrance of the village. 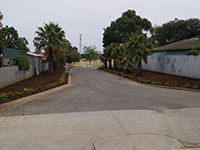 The work included plantings and spreading of mulch to beautify along the roadway leading into the village. GCRH is indebted to the Rotary Club of Gawler Light, for their on-going support, over a number of years now. This work will assist with the planning for the future of the village. A number of current residents have been complimentary of the improvements to their entrance. There will be further enhancements to the entrance, to assist people driving along Dawkins Avenue to more easily identify the entrance.